Welcome to paradise! We’re so glad you’ve decided to stay in one of our Cozumel vacation rentals. Here are a few tips to make getting around easier so that you can make the most of your trip. IsIs Rental rentadoraisis@prodigy.net.mx OR check out on www.islacozumel.net They cannot pick you up at the airport upon arrival but will pick you up at the condo to return your rental car and drop you off at the airport. Contact our manager Luis while visiting for suggestions. Taxi’s are not allowed to make pickups at the airports, only drop-offs. If you want a taxi from the airport you must walk across the street to the traffic circle. You can catch a taxi to the condo for roughly $20.00 US per couple. Please confirm your amount with the driver first. Your taxi driver would be glad to drop you off at the MEGA or CHEDRAUI grocery store. He would be happy to wait for you. Ask him FIRST how much that would be to wait for you. It is NOT determined by a timer. Please determine your fee up front. You can also request a taxi by calling the Security Guard telephone number listed next to the condo phone. You can request with the taxi driver in taking you throughout your travels for a day period-but PLEASE confirm your fee up front with the taxi driver. Exit the airport and follow Airport Road all the way until it ends at the sea or waterfront road; Melgar. Turn left. You are now heading south. Travel past town and stay on the main road. Do not take any of the roads marked CHANKANAAB. When you get to the KM 14 sign (means you are 14 kilometers south of town); you should see a traffic sign that says Sabor or Aura; please take the second exit to the right, and immediately turn left onto the old highway. You will see the sign marked Residencias Reef. (Turning right will take you to The Aura Hotel or Sabor Cozumel Resort and Spa). Just beyond the Residencias Reef office turn right to the Security Guard shack; STOP and show the guard your confirmation letter OR tell them your NAME and which CONDO you are staying in. Purchase a ticket at the Taxi booth (to the right as you exit customs with your luggage). After you have purchased your ticket, go outside and tell a shuttle van driver you are going to Residencias Reef Condos and he’ll show you which van to take. ENJOY the ride, you’ll stop at several other hotels dropping off other vacationers. The drivers know to STOP at the security Guard shack and provide your NAME and CONDO you are staying in. If you need assistance with your luggage please tell the security guard and he will send someone over. The driver knows the layout of the Residencias Reef Condos so they will drop you off in front of the appropriate building. 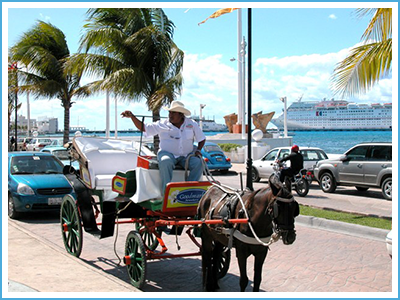 If you have arrived to Cozumel via the ferry, pick up your luggage and walk to the road where you will find the TAXI’s lined up along the main waterfront road; Melgar. If you need help with your bags there are porters with special baggage tricycles to assist you. Stop at the Security Gate and inform the Guard your NAME & CONDO Number. They will direct you or your driver to your appropriate building (Unit 8310 is building #4, Unit 5120 is building #1 & Unit 7330 is building #3). PLEASE let the security guard know if you need assistance with luggage and they will send someone over (Tips graciously accepted). Should you arrive before the 4 pm arrival time you can request the security hold your luggage in a secured building while you walk the grounds until the unit is ready, unless early arrival has been pre-arranged. Departure time is 10 am unless pre-arranged with Management. We take pride in having the unit ready for your stay.